Vice President Joe Biden gestures toward former Vice President Walter Mondale as they participate in a forum honoring Mondale’s legacy, at George Washington University in Washington, Oct. 20, 2015. Still silent about his presidential ambitions, Vice President Joe Biden cast himself as President Barack Obama's kindred spirit Tuesday and backtracked on his previous claims to have advised Obama against the raid that killed Osama bin Laden. Without mentioning Hillary Rodham Clinton by name, Biden sought to portray his own leadership as more critical to the Obama administration's successes than that of the Democratic front-runner and former secretary of state. At a forum honoring former Vice President Walter Mondale, Biden offered clear hints at how, if he runs for president, he would contest Clinton's claim to the president's legacy and appeal to Democratic voters whose loyalty to Obama remains firm. "President Obama and I have ideologically had no disagreement," Biden said. "I mean none. Zero." With his 2016 deliberations extending deep into overtime, Biden offered no explicit clues about his decision. Yet he took a number of veiled shots at Clinton, who said in last week's Democratic debate that the enemy she was most proud to have made was "probably the Republicans." "The other team is not the enemy," Biden said later Tuesday at an evening gala honoring Mondale. "If you treat it as the enemy, there is no way we can ever, ever, ever, ever resolve the problems we have to." He repeatedly described that approach as "naive." Vice President Joe Biden speaks as he takes part in a tribute to former Vice President Walter Mondale in Washington, October 20, 2015. In an unusual reversal, Biden revised his claim to have warned Obama against the bin Laden raid in 2011 — a notion Obama himself corroborated in a 2012 presidential debate. As Obama campaigned for re-election, that factoid had the effect of making Obama appear more bullish and prescient than his advisers, but could be used as an argument against Biden's foreign policy bona fides if he challenges Clinton for the nomination. Clinton has said she supported the raid from the start, using it as an example on the campaign trail to bolster her credibility as a valued and hardened adviser to Obama on matters of national security. But Biden implicitly contradicted Clinton's account, insisting that only the defense secretary and CIA chief were fully in favor of the raid. According to Biden's account, Obama asked his advisers in the Situation Room whether to proceed with the risky raid on a compound in Abbottabad, Pakistan. Biden said he suggested holding off while the military flew another drone over the compound to gain certainty about bin Laden's whereabouts, but stopped short of saying "go" or "don't go" in front of other advisers to avoid undercutting Obama's ultimate decision. Instead, Biden said, he waited until he and Obama had left the room and offered his opinion in private: "I told him my opinion. 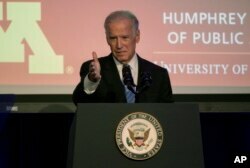 I thought he should go, but follow his own instincts," Biden said. Adding another wrinkle to the historical account, Biden said he knew about the Abbottabad compound where bin Laden was hiding in August 2010 — long before the "major players" in Obama's Cabinet learned about it in January or February. The vice president's new take on a years-old event put the White House in a difficult spot, the latest example of how a Biden candidacy would imbue the rest of Obama's presidency with heavy political overtones. White House spokesman Josh Earnest declined to say whether Biden's recollection was accurate. "I'm going to leave the dissection and the oral history, if you will, of those days to those who were actually there," Earnest said. The Democratic political world has been on edge for weeks awaiting a decision from Biden, who has blown past his own deadlines for deciding even as advisers insist he understands the importance of getting in or out soon. Rampant speculation took a chaotic turn Monday with a flood of assertions that Biden was running or would announce a run imminently. Biden's only direct mention of Clinton came in what seemed like a backhanded compliment. At Mondale's gala, Biden expanded on his observation that he was the one Obama would dispatch to speak to key world leaders like Russian President Vladimir Putin or Turkish President Recep Tayyip Erdogan. "John Kerry is a great secretary of state. Hillary Clinton was a great secretary of state," Biden said. "But there are times when only the vice president, if it's known of his relationship with the president, can speak for the United States."